Wheat Germ is the heart of the wheat berry. It has a delicious nutty flavor, and is packed with nutrition. For a scant 45 calories and one gram of unsaturated fat, a two tablespoon serving will provide to grams of dietary fiber, ten percent of recommended daily value of folic acid, eight percent of recommended daily value of phosphorus, magnesium and zinc, fifteen percent of your vitamin E and ten percent of your thiamin requirements. It is a cholesterol and sodium free food, and its fat is unsaturated. You can use Wheat Germ to replace up to one half cup of flour when baking cookies, muffins and breads. 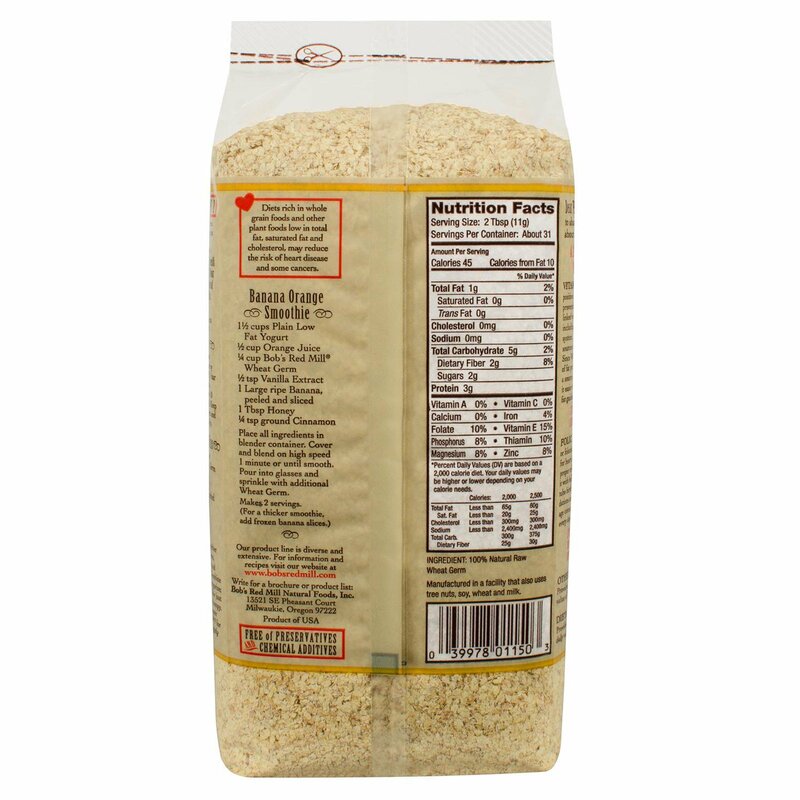 Use it as a topping for fruit pies, fruit salads, yogurt and ice cream, or as a nutritious breading for chicken or fish and as filler for meatballs and meatloaf. Dear Friends, we would like to share important information about Wheat Germ with you. Vitamin E - Best known for its positive association with heart disease prevention, vitamin E has also been linked with a host of other health benefits including strengthening the immune system. Ironically, some of the best sources of vitamin E are higher-fat foods. Since Wheat Germ contains only 1 gram of fat per serving, adding wheat germ as a source of vitamin E to your diet makes it easier to stay within the recommended fat guidelines. Folic Acid - Also known as folate or folacin. This B vitamin is necessary for heart and blood vessel health, and for proper cell replication. Research has linked it with helping to protect against neural tube birth defects. Current recommendations are that all women of childbearing age consume 400 micrograms of folic acid every day. Provides 8% of the recommended Daily Value of Phosphorus, Magnesium and Zinc. Provides 8% of the recommended daily value. 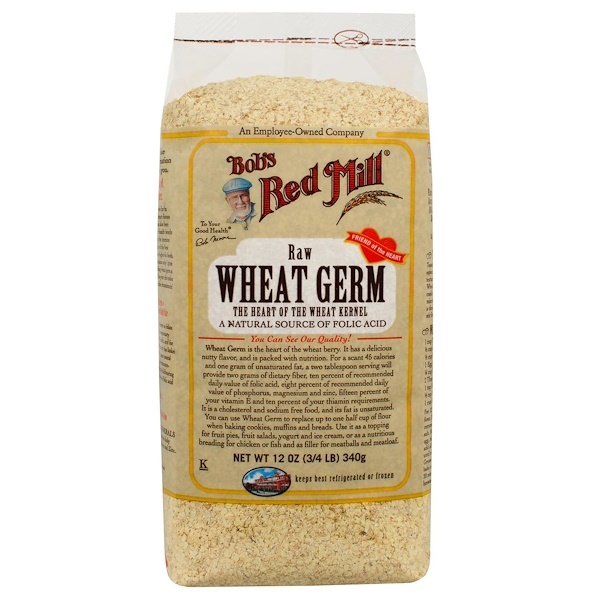 Toasting Wheat Germ gives it an especially nutty flavor and crunchy texture. Set your oven to 350ºF. Pour Wheat Germ in a thin layer on a cookie sheet and bake it for 5 to 10 minutes or until lightly browned. Keep a close watch on the Wheat Germ and stir frequently, as it browns easily.